Khushi Kumari Gupta stared at her reflection and frowned. She was wearing a pale yellow chiffon saree with embroidered orange roses all along the edges. What was the point of flowers if they couldn’t be seen! She had unsuccessfully been trying to pin up her aanchal so that the flowers showed. With an exasperated sigh she looked at the reflection of Arnav Singh Raizada. He was wearing a navy blue and white horizontal stripped v-neck sweater. Actually, it was not really a sweater… Khushi wasn’t sure what to call it because sweaters were supposed to be hand knitted, baggy, but this fit Arnavji perfectly. His lean structure highlighted further by the fabric and Khushi had no idea how that was even possible for a sweater to do. Arnavji’s head was bent towards his laptop. His brow was furrowed, as always, in deep concentration. His eyes had forgotten to blink it seemed. She was tempted to remain standing and go on staring. Startled out of her staring, she hit herself on her forhead.. “hey devi maiyya I am already late“..
“shut up Khushi“, his eyes had not moved from the screen. Indignantly Khushi walked upto him. “Arnavji aap..”. She did not continue. Her words did not seem to have broken his concentration at all. Full of ire, she was about to turn away, when a firm brown hand shot out, grasped her wrist and pulled. She found herself seated on his lap, cocooned in his warmth. A fuzzy feeling had crept inside her. That was before she realized she was staring into the most beautiful pair of brown eyes. Her insides were melting, a light headedness descending. “Actually I prefer Arnav“, he stated, complacent to have her where she was. “tum kuch keh rahi thi? Hmm?“.. And his lips moved closer to her..
Khushi woke up with a start, her heart racing. She made sure Payal was sleeping soundly before tip toeing out of the room. In the kitchen she lit a single candle. The light was enough, as she had long ago by hearted the place of each jar that contained the ingredients for her jilebis. She swirled her hair into a knot, shook her head vigorously to make sure there was no threat of errant strands escaping their confine. With a distracted air she firmly fastened the end of her dupatta along her slim waist. Then she dumped a heaped cup of flower into a big steel mixing bowl. Even in the dim candle light the steel gleamed. Buaji made sure her age old utensils shone. However, the girl busy preparing the batter for jilebis noticed none of this. 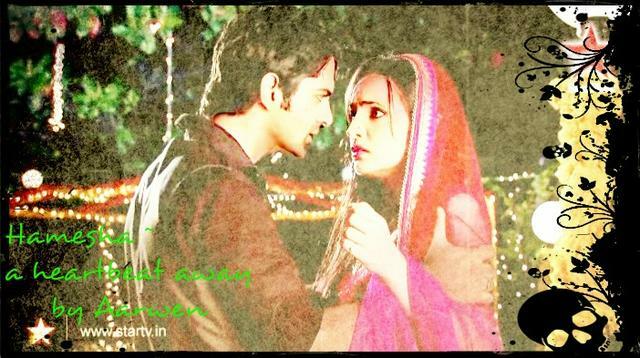 Khushi had come to expect that the laad governor would find a way into her dreams. Only lately instead of only scaring her and infuriating her as he had numerous times before, these days he affected her in all sorts of other ways. She felt like dancing, and bursting into a song and eating a million jilebis every time he looked at her. His eyes holding a promise of sparkling stars that he would bring for her. His touch ignited every nerve within her, but she never felt as secure as in his arms. devi maiyya humein kya ho raha hai.. kya yehi..
She clenched her eyes tight.. devi maiyya humein Arnavji se pyar ho gaya hai.. Her eyes flew open, wide and sparkling as the candle flame reached the iris. She used her handed to swirl the batter in a fervid circular motion. She could not be falling in love with that laad governor..
Last time she had thought all this it had ended with his declaration.. koi faraq nai parta.. But even then she had not walked away. She could not. And even then she had felt safe. Heartbroken, but the thought of not seeing him had been more painful. Not talking to him hurt even more. She knew him now. Understood him. His curt words, angry glares, the boyish look that came upon with when he broke into a smile, she was in love with all of him. In utter panic she flicked her wrist s the jilebi batter flowed into the hot oil. In two days she was going to marry him. Not because of jiji, not because of a playful plan, not because of di. devi maiyya hum Arnavji ke paas rehna chahte hai.. hamesha.. In a flash her mind remembered the sneering words of a devious man. Shyamji had blocked her way as she had been rushing out of Arnavji’s room that morning. She had been blissfully happy and his words had poisoned her mood. She did not want to listen to him, definitely not believe him, but they rang in her ears. “Saale saab does not love anyone except his family. And he has only one family..rani sahiba.. He may be sorry for you, but that is it. Par hum aapse pyar karte hai Khushiji“. She had shrieked and warned him, “humse dur rahiye Shyamji“. He had gone on however. “We understand each other Khushiji. Our middlle class simple lives. Wo aap pe bas taras kha rahe hai. Rani sahiba asked him so he agreed to the wedding. He does not love you“. She had wanted to slap him again, but the house was full of people. She had turned her back on him and not thought about his words. But what if it was true? What if Arnavji was doing all this just to be helpful? “kya hua hai Khushi? tum jilebia jala kyu rahi ho?“, Payal was rubbing her sleepy eyes, but looking extremely worried seeing a distraught Khushi and a plate full of burnt to char jilebis. “Khushi kya baat hai? Tum thik toh ho na?“, alarmed, Payal stroked her sisters hair lovingly. “humein nai pata jeeji.. Kuch garbar hai“. Khushi looked forlorn and miserable. “Khushi tell me what is worrying you? You know you can talk me to me“, Payal asked her gently. “kuch bhi toh nai jiji.. Humari shaadi ho rahi hai.. To that laad governor.. Jilebiya toh jalengi hi na.. See its black.. His color“, and Khushi laughed merrily. Payal knew she would not get anything more out of Khushi, but she hoped Arnavji would take care of whatever it was that was troubling Khushi. ASR moved with a brisk pace, a black tie in one hand, the other adjusting the blue tooth to his ears. He continue to rattle of instructions to Aman at a singularly fact pace. He knew at the other end Aman’s hands would be flying over his notepad, not missing a single detail. He whirled around, his eyes resting on her. He didn’t think he would ever get used to seeing her right in front of him. A sudden burst of life that shot up his bloodstream every time she came before him. She looked angry. She was in her regular Khushi clothes today. Green and yellow with lots of dangling bits everywhere. As she continued to fume in anger her small earrings swayed catching his undivided attention. “Aman I’ll call you back“. He disconnected the call. “kya hua Khushi?“, he asked her in a steady voice. “Don’t act like you don’t know“. What in the hell was she talking about? “Buaji told me you sent babuji for check up to the hospital. Hum khud kar lenge. I can take care of babuji on my own. Humein aapki madad nai chahiye. You don’t need to pity us. Humein aapka ehsan nai chahiye, hum seh nai payenge“. “Khushi wait.. Listen to me dammit“, ASR extended his hand out to reach her, but she had turned and stomped off. Her foot caught at the rug end and she hurtled forward, her phone falling to the floor. He rushed to her, voice urgent and worried, “Khushi dhyan se, lagi tumhe?“. “Tum thik ho?“, his hand was still on her shoulder. She was staring at him, tears pooling into her limpid eyes. They slowly stood up together, their gaze not leaving the other. “Khushi main..” , he swallowed. It was time to tell her how he really felt. Pity? He wanted to laugh at her crazy deduction. What he felt for her was..
She was gone before he could complete his thought, let alone say it out loud. 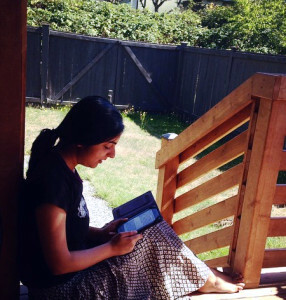 Her tinkering payal was all that could be heard. He made a move to follow her, but dashed into Anjali right outside his door. “Aapko lagi di?“, he held out a hand to support her. “offo no chote, but tumhe lagegi if you dare step out of the house today. We need to buy a ring for Khushi bhabhi. And since your wife is going to wear it on her finger every day, you should select it for her. Ab chalo. Itna time nahi hai baba. Kal saadi hai“, Anjali had oscillated between looking scary and happy during the entire breathless speech. His di was so happy planning the two weddings, resolutely ignoring the truth about Shyam. He put his arm around her and hugged her close. He had to keep her safe. And there was one more girl he had to keep absolutely safe. Khushi. “mami ye haar payal bhabhi ke liye hai“.. Anjali was desperately trying to get people to start getting dressed for the evening, but mami was causing a problem. “hello hi bye bye.. Anjali bitiya.. “, she might have had much more to say, but everything stopped as Lakshmiji leapt into the center of the living room. A panting, fat and tired buaji closely following. Right behind the two was a thin girl raising her lehenga with both hands to keep up. “ee dekho nand kishore.. Humaar haar leke bhagi“, buaji bellowed in her loud voice, trying to corner Lakshmiji who had a pouch hanging from her mouth. Since no one knew for certain what Lakshimiji really felt one could only make a wild guess that she had confused the green of the pouch with a more leafy sort of green. Round the center table Lakshmiji went, her bells jingling, buaji heaving herself right behind. “buaji.. Lakshmiji..“, by now even Khushi was out of breath. Before anyone knew it Lakshmiji had dropped the pouch onto mamiji’s lap and picked up a more promising looking leafy green necklace instead. The leafy green were big sparkling emeralds and of no use whatsoever to Lakshmiji, but it would have been hard to explain that to her. “maee“.. she was about to dash off again, but ran out of luck this time. Khushi had managed to corner the innocent necklace thief from the opposite side. She carefully extricated the necklace and handed it over to a grudgingly grateful mamiji. “ee miss call ke toh..“, mamiji eyed Lakshmiji darkly. “hainn? miss call? Kaun ka miss call.. I did not hear anything nand kisore..“, buaji turned her head on all sides trying to locate the ringing phone. “arre buaji missed call humari Lakshmiji ka naam hai“, Shyam had walked in, in a cream silk kurta all ready for the evening. Buaji ignored him, but Shyam still flashed his white teeth at everyone. Khushi was in no mood to spend a second in his presence. He had done enough of damage. She knew she loved Arnavji, and she didn’t know why Arnavji was marrying her. Was she actually calmly thinking about being in love with Arnavji? With both her hands she held both sides of her head. “devi maiyya hum pagal ho re hai“.. and stalked away, Lakshmiji following her like a little lamb. ASR had returned from jeweler and was now in his room, loosening his tie. Di had said they were already extremely late and everyone should go get dressed for the ceremony as guests would start arriving soon. Wondering if he should take a chance at an angry wedding planner di, ASR was contemplating finding Khushi. She was here somewhere. All the Gupta family was here getting ready, but it was not because of this knowledge that he knew she was in Shantivan. He knew she was close because he could feel her. A sudden burst of loud music caused him to look around at the unexpected interruption to his thoughts. Khushi’s phone lay glowing on the floor. He walked over it. She had dropped it when she tripped earlier. Om Prakash walked in with a cup of coffee. “OP where is Khushi?“, ASR had made up his mind he wanted to see her and tell her. Exactly what.. once he got their he would know.. The thought made his expression a little dreamy, softening the perfect features. He made his way up the stairs to the roof top. OP was a highly reliable source of information about the whereabouts of everyone it seemed. Mami had insisted on being in charge of todays decoration and that meant there was more than enough layers of highly fragrant roses everywhere. There were marigolds too and expensive orchids and who knew what else. A mish mash of loud colors. 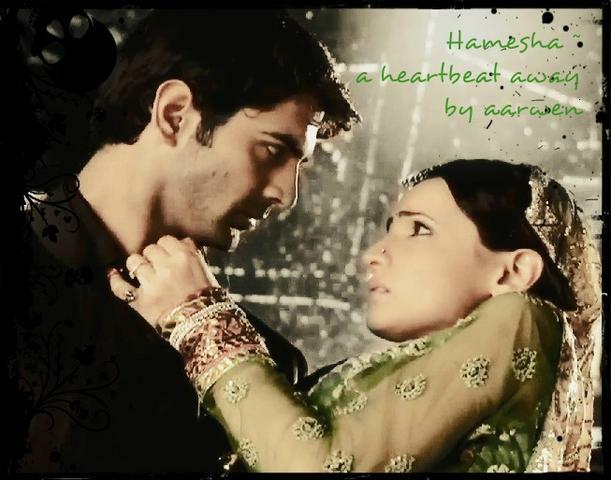 The air felt thick with the scent of flowers as ASR opened the door of the rooftop. She was there, carefully kneeling and whispering in a goat’s ear. He had not made a sound, but she turned towards him. The smile that was on her lips, as she spoke to her beloved Laksmiji, considerably lessened seeing him. She was wearing a bridal red lehenga, a vibrant pink dupatta covering her head. Even at her slightest movement the stars of the sky settled into the folds of the fabric and glimmered enticingly at him. She was beautiful. A half forgotten memory of seeing her with a dupatta on her head wafted towards him. He had been compelled to turn back and look at her that day. Today he took a step forward towards her. She waited, held captive by him, even though he was across the breath of the roof top. “ye lo“, he extended his arm out. He was an idiot. He was here to talk about what he was feeling not waste time giving her a damn phone.. but prolonging the moment, watching her, savouring the feeling, held a strange fascination at this instant. dhak dhak dhak.. was it his heartbeat again? “I don’t want it“, she mumbled, her hand crumpling her lehenga. His eyes were arrested by the blush that had come creeping onto her cheeks. It was not the cold that brought the color to her cheeks. He himself was the sole reason for the lovely sight. Feeling quite proud at this accomplishment his lips tilted in a dashing smile. “This is your phone Khushi“, he sauntered close. “humne kaha na humein aapse kuch nahi chahiye“, she said resolute at her stand of not looking towards him. Then with a surprising flash of energy her eyes captured his as she spoke firmly, “I don’t want anything from you because all you feel is sorry for me“. His impatience stole over his indulgence, and his eyes glinted dangerously. “tum pagal ho gayi ho“. “nahin. aap.. aap humse shadi kar re hai because di told you or maybe because you.. I will not marry you just because of some plan.. you feel sorry for me.. Hum aapse shaadi nai kar sakte Arnavji“.. In an instant he understood what it was that she was hinting at. Did she really think that all these days it was all di or some philanthropic need of his to do good? Maybe she didn’t know him at all. “That’s right. I forgot. If you stopped your nonsense for a minute and allowed yourself to open those beautiful eyes of yours even then you would miss the real thing“, voice was laced with sarcasm. His jaw was clenched, stunning angular lines visible on the prominent high cheekbones. He had swiftly caught her slender arms and jerked her close with a feline power. Deep down she had wanted him to refute her claim that he was doing it for di. She wanted him to look at her tenderly and say he wanted the marriage to happen. That was in her dream. In reality he was absolutely furious. She fought back even though her heart felt like it was shattering into tiny little shards each piercing some corner of her chest. “humein kya nai dikh ra batyiye humein?”, she demanded angrily. If he wanted to fight that is what she would do. “that I love you dammit..” The words came hurtling out from within him leaving him dazed. The words remained suspended, sizzling the air between them. Both were still for who knows how long. Might have been a second, felt like forever. Then he pushed her away, turned and strode off. He did not look back to witness the slow awestruck smile spreading on her face. He was not thinking. A rush of adrenaline and love pumping in his veins as he entered his room. Again a happy loud sound jarred its way into his conscious. Her phone was still clutched in his hands. His knuckles were white as his fist had tightened around it. Another message. He glanced at the phone, mind caught up in the arresting beautiful face of the girl he loved. It was a fact. He had known all along. He had known as she had struggled in his arms today and on their very first meeting. Had he known as he had lost control and ripped those pearls? Had he known when he had seen her in his office? Even when he had let go of her hand. When she stood before him in red. When he touched her face as she lay unconscious in his arms, fragile. When he had kept her payal. When he had made her wear it. He had known why he wanted to kiss her. He had known why he missed her. Even when he brought tears to her eyes. Specially when she made him angery. Why she made him insanely jealous. Why he felt ridiculously tender and outrageously happy around her. Why he danced with her. Why he wanted to be held by her. He loved her. The feeling had stolen over him, gradually claiming him. Now consuming him. He loved Khushi. It made him happy. A calm settled into his heart lighting everything inside him. She made him happy. It was then his eyes focused on the words on the phone screen. ASR’s eyes darkened.. A lethal glint in them.. It was a message from Shyam… on Khushi’s phone..
that bloody Shyam…why can’t they be in their rabbave land without these disturbances..